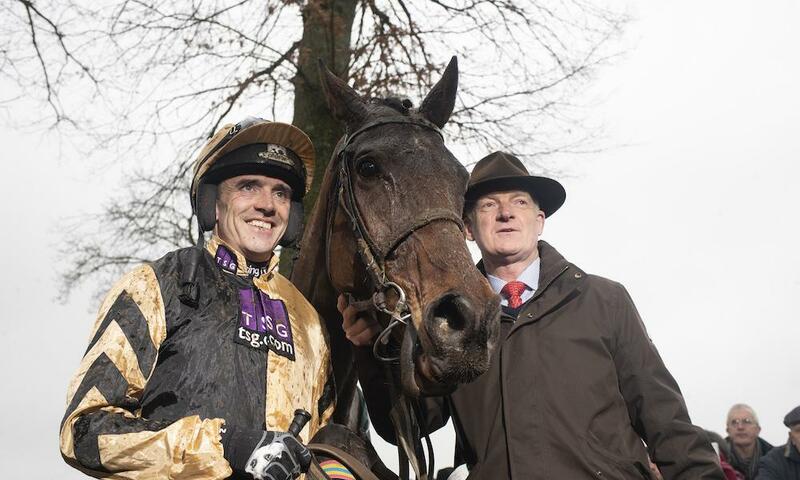 It was a day of glory at Gowran Park for the biggest racing day of the year at the venue, the Thyestes Chase Day which has been dubbed as "the race that stops the county". An impressive five Tattersalls Ireland graduates entered the winners' enclosure with the feature race being claimed by Derby and November Sale graduate INVITATION ONLY. Never off the pace, INVITIATION ONLY partnered by Ruby Walsh, produced a scintillating performance to take the highly regarded Thyestes Handicap Chase for trainer Willie Mullins and owners Graham and Andrea Wylie. The class exhibition by the Flemensfirth eight-year-old has selected him as a consideration for the big one in March, the Cheltenham Gold Cup. Twice a graduate of Tattersalls Ireland, INVITATION ONLY was sold as a three-year-old at the Derby Sale by Rathyork Stud to Patrick McCormack for €40,000. Prior to this, he was sold as a foal by Mountain View Stud on behalf of his breeder Seamus McKeogh for €17,500 to Scott Mernagh. Earlier in the day, Gold Cup favourite PRESENTING PERCY returned to action on the Gr.2 Galmoy Hurdle and he did not disappoint onlookers cementing his position as leading contender for the contest in March. A foot-perfect performance sealed victory for connections, Pat Kelly, Philip Reynolds and Davy Russell. PRESENTING PERCY was sold through the ring as a foal at the 2011 November NH Sale by Burgage Stud for his breeders Preston Lodge Stud to Lime Farm for €22,000. The opener on the day, the Handicap Hurdle was won in good style by Robert and Mary Tyner's Derby Sale graduate Spare Brakes in the hands of Philip Enright (purchased at the 2013 Derby Sale by the Travelling Light Syndicate for €26,000 from Whitehorse Stud) followed by victory in the Auction Maiden Hurdle for Peter Fahey's The Big Dog with David Mullins in the saddle for owners Damien J Kelly and Colin Kelly (purchased at the 2013 November NH Sale by Derrygrath Stud for €9,500 from Kevin Neville). Cilaos Emery made an impressive chasing debut to take the Beginners Chase and write himself into contention for the Arkle Chase. Winning the race by four lengths, the son of Claifet jumped and travelled well and is certainly one to excite trainer Willie Mullins and owner Luke McMahon. Cilaos Emery was sold at the 2012 November NH Sale by Galbertstown Stud to Harold Kirk for €7,200.